2018 will mark the 70th anniversary of the Universal Declaration of Human Rights. To celebrate the Anniversary, Bill Shipsey (founder of Art for Amnesty, a human rights activist, lawyer and lifelong member of Amnesty International) has created a project entitled “Le Rêve d’Eleanor” (“Eleanor’s Dream”). To promote a world in which the rights of all human beings are fully respected, the project invites artists from every artistic discipline the world over to dedicate at least one of their creative adventures to it. It may be a concert, a show, an exhibition or any other artistic performance produced during the year. “Le Rêve d’Eleanor” is a tribute to Eleanor Roosevelt, who played a crucial role in the adoption of the Declaration on 10th December 1948. 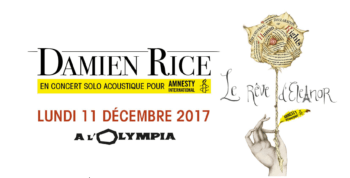 Damien Rice’s solo acoustic concert to benefit Amnesty International at Paris’s prestigious Olympia Music Hall on Monday 11th December 2017 will mark the start of this fabulous celebration. Damien last performed for Amnesty at the “Electric Burma concert for Aung Suu Kyi in 2012. On December 10, 2018, exactly 70 years after the adoption of the Universal Declaration of Human Rights – a grand concert will be held at the AccorHotels Arena in Paris on 10th December 2018! More information to follow. Tickets will be on sell on GDP.FR on Monday, July 24th – 10 AM.